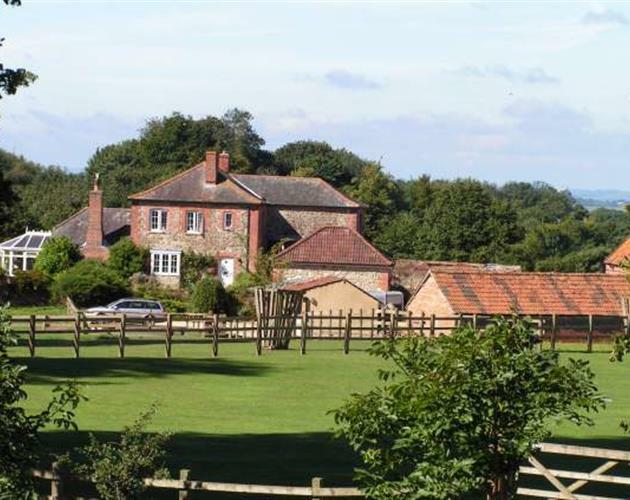 Situated just two miles south of the market town of Devizes, Blounts Court Farm is located on the edge of the village of Potterne. Set in 200 acres of arable farmland, we back onto woodland with the village cricket field to the rear of the house. The world heritage sites of Stonehenge and Avebury are 15 minutes by car, Lacock (the television series Cranford to name but one was filmed here) is also 15 minutes by car and Bath & Salisbury can be reached in 30 minutes. Many National Trust properties are on the doorstep including the beautiful gardens of Stourhead. Longleat House and Safari Park is also closeby. We also have the enviable position of being walking distance to the village public house (pub) which serves local beer and meals. HOME FROM HOME FARMHOUSE ACCOMMODATION . . .
All our bedrooms have been individually styled to enhance our guests' visit to Blounts Court Farm. We offer en-suite double, twin and single rooms (all with crisp, quality linen and fluffy towels), private guest sitting room and because we appreciate our guests like to come and go as they please, have their own entrance. All our accommodation is located on the ground floor. The hospitality trays include various teas (green, fruit etc. ), coffee both caffeinated and decaffeinated, hot chocolate and a jug of fresh drinking water (as we try to support sustainable tourism we do not believe in using bottled water). All rooms have flat screen television/dvd players with freeview and have Wi-Fi broadband access for guests bringing their own computer. All in all, the perfect base for visitors or business guests alike with ample safe parking. We are extremely priviledged to have been awarded a 5 YELLOW STAR award with the AA (which means we are one of the top 10% accommodation providers in the country). If you are looking for peace & quiet, home from home and stylish accommodation then Blounts Court Farm is for you. Breakfast is taken around our large mahogany dining table in our dining room surrounded by antiques. We offer an extensive menu with delicious and freshly prepared aga cooked meals to order. Bread and preserves are all home-made and we try to source as much local produce as possible. Our eggs come from our own rescued 'battery' hens, who are now free to roam wherever they like around the farm (bought free-range eggs are available if preferred). Special diets can be catered for. IN OUR ROOMS YOU WILL FIND . . .